I hope you all had a wonderful Christmas. I enjoyed the holiday very much this year. My son, daughter-in-law, and my mother came down for a few days, and along with The Husband and my daughter, we ate and shopped and ate and shopped and then we ate (I am gonna have to use a gift card to buy some bigger jeans). In keeping with holiday tradition in my family, we played a few card games which I lost by a ridiculous margin and I personally set a new record for the world's worst score in Phase 10. Loved every minute of it. There was some yarn inside that cup when they gave it to me and I'm already half way done with my grandbaby's going home outfit. I'll share it another time, as I'm not revealing what I'm knitting to my son and DIL just yet. I'm already spending tons of time adding patterns to my Ravelry library. Of course, I don't know yet whether the wee one is a boy or a girl, so the possibilities will expand exponentially when that is revealed. All I know is that this baby will not want for love or for wool. Congrats! What a great way to reveal the pregnancy! Have fun with all the knitting. Baby items are so addictive and tiny and adorable. Oh, that is exciting and I can see why it would change your knitting plans! Congrats!! That's such a cute way for them to tell you! Wasn't it? 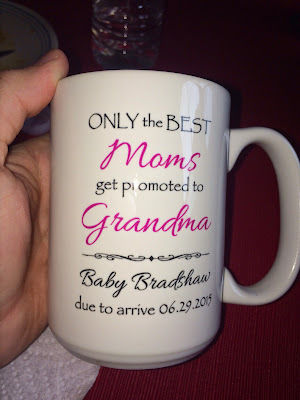 Apparently they found the mug on Etsy!